A longtime leader in technological advancement, the Capital Region is at the front of New York’s economy – ranking high in both productivity and patenting. We are also in the middle of a major geographic region, with New York City, Boston and Montreal just three-hour drives away and 40 percent of North America’s population a day’s drive away. Here, being in the front and the middle is not a paradox, it’s a way of life. It’s what allows our employers to tap into R&D centers and talent pipelines at our 22 colleges and universities and what allows our employees to spend less time commuting to work and more time doing what they enjoy at our nearby regional attractions. Front and center: That’s the Capital Region. In our backyard you’ll find the “Birthplace of Innovation” (i.e., General Electric’s Schenectady campus), endless beauty – from the southern Adirondacks to the northern Catskills – and immense brainpower at nationally recognized R&D centers such as the SUNY Polytechnic Institute in Albany and Rensselaer Polytechnic Institute (RPI) in Troy. At 711,000 square feet, we have the nation’s seventh greatest amount of academic R&D space for engineering and 1.6 million square feet of R&D space across all fields. Running through the region is the majestic Hudson River, which flows past the state’s northern-most, 12-month port and vibrant downtowns buzzing with breweries and tech startups in Albany and Troy. Our workforce is one of our greatest assets. We have the nation’s seventh highest concentration of physical, engineering and biological research workers – almost 7,000 of them. Capital Region colleges and universities provide our businesses with a pipeline of talent, awards bachelor’s and master’s degrees to more than 890 students in engineering, 550 in biological and biomedical sciences and 250 in physical sciences. Our community colleges, such as Hudson Valley Community College, also offer unique training programs for high tech industries, including photovoltaics and semiconductor manufacturing. Each year they award associate’s degrees to nearly 150 students in both computer and information sciences and engineering-related fields. 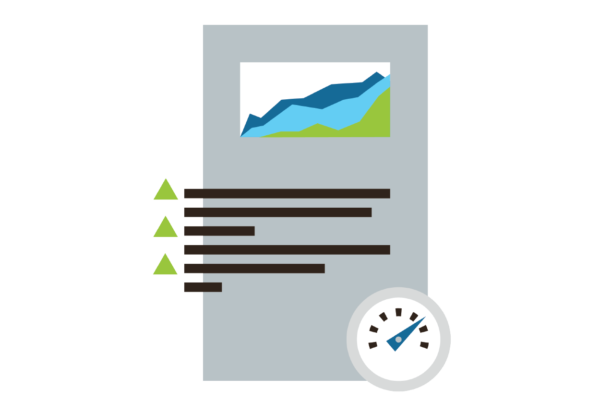 CEG’s Capital Region Economic Scorecards are a quarterly feature of the organization’s newsletter, The CEG Indicator, and are offered exclusively to our investors. These scorecards track 30 mostly local economic indicators to provide our investors with insights into the health of the region’s economy and the direction in which it is headed. There are five scorecards: Quarterly Performance Overview; General Economic, Manufacturing, Consumer and Transportation indicators. At 5,333 square miles, the Capital Region is almost the size of Connecticut. Getting around is easy, with three major interstate highways running through the region – the New York State Thruway (I-87/I-90), the Adirondack Northway (I-87), and I-88. Albany International Airport offers national carrier and regional commuter air service and air freight service, and railway freight and passenger services are provided by CSX Corp., CP Rail Systems and Amtrak. The deep-water Port of Albany is located 126 nautical miles north of New York City and Great Lakes ports are accessible via the New York State Canal System. 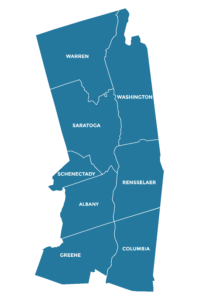 The region consists of eight counties: Albany, Columbia, Greene, Rensselaer, Saratoga, Schenectady, Warren and Washington. More than 1 million people call the Capital Region home, and a third of our population over 25 years old has a bachelor’s degree or higher. Our residents enjoy living in communities that are close to where they work (the average commute is 24.08 minutes) and that are affordable. Median home prices and rents are below the national average while the median family income is above that average. The area has the state’s second highest per capita personal income. On top of these economic opportunities, there are a bevy of entertainment and recreational ones, too, including sporting events or concerts at the Times Union Center, performing arts at SPAC and Proctors Theatre, and a dozen state parks plus the Catskill Park and Lake George region. 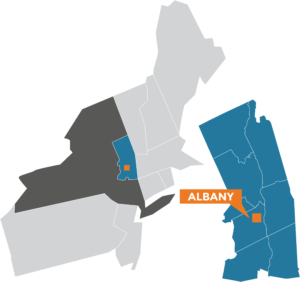 This county is the seat of New York’s capital and home to a burgeoning software IT sector, 12 colleges and universities and major R&D centers such as SUNY Polytechnic, Albany Medical Center, Albany College of Pharmacy and Health Sciences, and the Wadsworth Center. With more than 3,800 private sector scientific research and development services employees and and employment location quotient of 3.55, Albany County has New York’s highest – and the nation’s 29th highest – concentration of these highly skilled workers. This county has the nation’s third highest concentration of independent artists. Its historic communities, such as Hudson, have undergone cultural revivals and its industrial parks have attracted many manufacturing operations such as Sonoco-Crellin, Craftech, Flanders and Pretium Packaging. Located in the Catskills, this county has a high concentration of leisure and hospitality sector workers thanks to two major ski centers and several smaller resorts. The county has a wealth of shovel-ready sites and has direct access to rail and the New York State Thruway, making it an ideal location for logistics and distribution companies. Light manufacturing operations such as Ducommun (Dynabil) and SERTA are operating here. This county is home to the nation’s oldest technological research university, which also has the world’s most powerful supercomputer at an academic institution. It is a thriving technology industry in the areas of software development, gaming, cyber-security and information technology and is at the forefront of biotechnology research, housing Regeneron Pharmaceuticals, RPI’s Center for Biotechnology & Interdisciplinary Studies, University at Albany Health Science Campus, and GE Healthcare. This county is internationally known for the historic Saratoga Race Course, but it is also at the forefront of clean energy, advanced nuclear propulsion and semiconductor R&D due to the Saratoga Technology and Energy Park (STEP), Knolls Atomic Power Laboratory and GLOBALFOUNDRIES Fab 8 chip plant. This county has deep industrial roots going back to Thomas Edison himself, positioning it to become a leader in advanced manufacturing thanks to GE Energy and GE Global Research. These counties have some of the nation’s highest comparative advantages for medical equipment and supplies manufacturing jobs, thanks to companies such as AngioDynamics and C.R. Bard, Inc. (also known as Bard). These counties also have deep roots in the paper industry, housing manufacturers such as Finch Paper and Irving Tissue.